Posted: November 26, 2010 10:40 p.m. 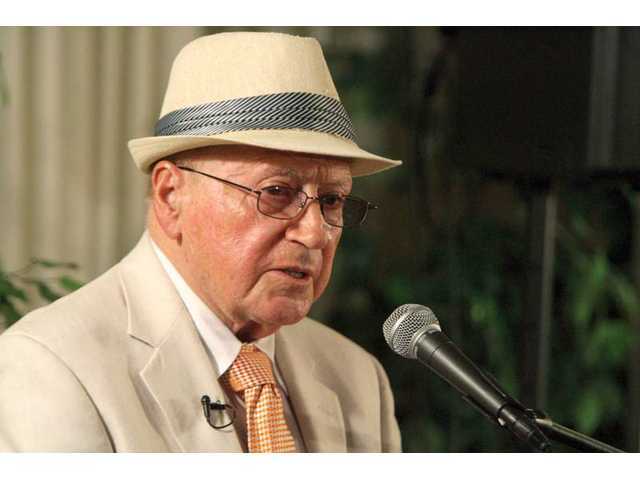 Updated: November 27, 2010 4:30 a.m.
Philip Bialowitz speaks to a capacity crowd at Chabad of SCV in Newhall on Nov. 17 regarding his experience at Sobibor, a top-secret World War II Nazi death camp. Bialowitz told the crowd about how he faked his own death to survive a Nazi firing squad’s attempt to kill him in Poland. Philip Bialowitz, 84, has not only painful memories of his time spent in Sobibor, a Nazi extermination camp in Poland during World War II. He also has a physical reminder. Bialowitz held up his finger and revealed a scar from a wound inflicted during his escape by the barbed wire fencing that ringed the camp. Nearly 180 people gathered Nov. 17 at the Chabad of SCV in Newhall to listen to Bialowitz retell his story of suffering and escape. He is one of only eight living survivors from Sobibor. “My finger was sliced, and the scar remains today,” Bialowitz said. A BBC video interview of Bialowitz returning to Sobibor opened the lecture. The scene was Poland, at the site of the former death camp. A foreboding rusted metal sign framed the entrance of the camp. Bialowitz recalled how, at 14 years old, he and other Jews faced a German firing squad. When the shooting began, he dropped to the floor and pretended to be dead, said Bialowitz. With many dead bodies piled over him, he lay still for hours with little room to breathe. Bialowitz barely escaped with his life, but he would soon be faced with the threat of death again. In April 1943 after faking death, Bialowitz and his surviving family members were captured and sent to the extermination camp. Sobibor was one of three top-secret Nazi death camps. “Ninety-nine percent of the people that were sent to Sobibor were sent to the gas chambers,” Bialowitz said. He recalled that only 600 prisoners were kept as slaves to run the camp. He and his brother were two of those prisoners. “My brother saved my life,” Bialowitz said. After they were taken, the Germans asked if there were any professionals. Simcha, Bialowitz’s brother, pulled him forward and said they were pharmacists. Everyone else who was not chosen was killed in the gas chambers. Bialowitz also recounted how the Nazis would bring Jews by the train-full to Sobibor under the guise of resettlement. They told them they would have a better life. The entrance was lined with beautiful flowers to create the illusion of peace. The Jews were ushered into a room to leave their belongings and encouraged to write postcards to tell their loved ones they were well. Bialowitz was given the job of cutting their hair before they were sent to the gas chambers. After the haircuts, they were asked to strip and shower — for sanitation reasons — before they would be shown their new quarters. Bialowitz spent six months at Sobibor. The death camp was situated deep in the forest enclosed by barbed wire, armed guard towers and surrounded by minefields. After a rumor began to spread that the camp would be closed and the remaining prisoners killed, the prisoners began to conceive of escape. They knew military know-how was needed. In September 1943, they were given exactly that. Jewish soldiers serving in the Russian army were captured and sent to Sobibor. Two of these soldiers, Sascha Pechersky and Leon Feldhendler, masterminded the revolt within a few weeks. During the revolt, the prisoners ambushed guards and killed them. They cut telephone wires and electricity lines. “Brothers, your moment of destiny has come,” Pechersky said to the prisoners as he stood on a table during roll call to rally them together. They then set the camp on fire and rushed to climb the barbed-wire fences. Before heading into the forest, they navigated past the minefields by running alongside Nazi buildings to avoid the detonations. In all, 200 of the 600 prisoners escaped alive. After the revolt, the Nazis killed all the remaining prisoners of Sobibor, dismantled the gas chambers and destroyed the camp to cover up the atrocious secret. Bialowitz and his brother fled to the Polish countryside, where a farmer helped them hide in his barn. They are they only two brothers to escape and survive the Nazi camps. His brother is 99 years old and lives in Israel today. Bialowitz stressed that this is an important topic for people to hear because genocide exists today in Africa and other countries.